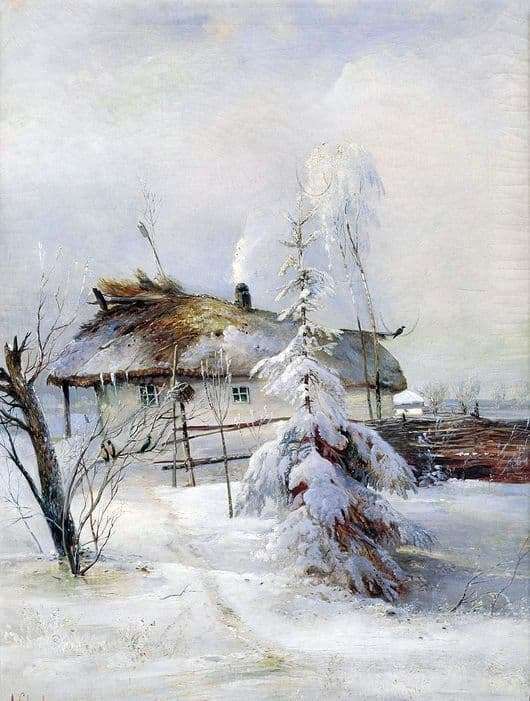 Winter landscapes in the work of Savrasov occupy a special place. Winter in the paintings of the artist is real, Russian and true to such an extent that looking at the pictures, it seems, you exhale the frosty air. In general, Savrasov is considered one of the creators of the Russian, or rather the Russian romantic landscape, which is unconditionally confirmed by the artist’s works. The picture of winter stands out both among winter landscapes and among romantic landscapes. There is a lot of snow in the picture. He is everywhere, and with a long viewing of the work, his eyes become just as painful as in nature in winter. Trees in the “silver” captivity and around the chilling silence, the silence of the frost. Everything seemed frozen in the winter silence, which one wants to enjoy, not noticing that this is just an illusion that arises due to the skill of the artist. The sky in the picture is winter, and together with the nature of the furnace smoke, which comes down from the chimney of the house, does not promise to improve the weather. Thanks to Savrasov’s mastery of drawing, the picture “Winter” clearly highlights the details, which, when viewing the work, creates a feeling of its volume. In the picture, the rickety house (a picture without artificial elements reproduced artificially) is natural and characteristic of the artist’s creative period. Thanks to this naturalness, which fits him well into the overall background of the picture, the house seems to give comfort and warmth. Again, thanks to the clear contours of the roof of the house and the wicker fence creates a sense of personal presence. Actually, such detailing required a lot of work. But the detailing is achieved not only by diligence, but also by understanding the essence of color on the part of the author. Referring to the colors, it should be noted that the picture has a very good color harmony. The effect of detailed drawing in combination with a successful combination of colors made the picture one of the samples of the winter landscape in Russian painting.